Oh, I really do believe this. Love, not hate. Love, not war. Love, love and more love. Valentine’s Day is this Friday. But each and every day is an opportunity to show love. Each day this week I’m giving something away…it’s my way of showing my own love for sticking with me every day, allowing me to share myself, sharing yourselves, and being a part of a life that encourages us to give. When we show our love for someone or something, magical things happen. Our world is so full of despair, unkindness, and fear. There’s never a better time than to express more of our love for self, the work we do, the people we surround ourselves with, and love for life. We need to give hope, inspiration, help each other and bring out the kindness of mankind. I have tried to love my entire life. Even when I was hurt. Despite the tragedies of loss, illness, unfairness, and all the hard parts life has thrown at me, I have always leaned on having more love. I try to surround myself with people who care, who believe in making a difference, and who share themselves and their love with others. So in honor of our need to give love more, this week’s blog series is on love. I will feature stories of people who love their work, have big dreams and know how to get others to love. They each have inspired more love in this world and have made a difference through the powerful expression of their own love. Maria is a change leader and wife and she will tell her story on change and what matters is how we live and love and how we spend our ‘dash’. Shana, romance novelist and bestselling author will talk about falling in love with yourself and your dreams. Frank, a 35-year career oil man, will tell a story of how winning put some life (and love) into an organization that had incredible talent, but was otherwise beaten. Love is kind. Love never fails. 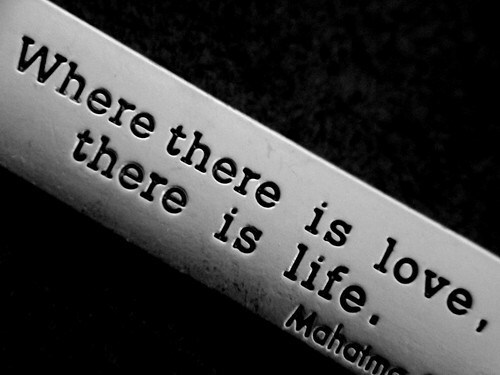 Where there is love, there is life. And yes, our greatest opportunity in this life is to learn to love more. If you give a little love, you can get a little love of your own. Today, share your own thoughts on love or on the video below, and I’ll be drawing a name from those below for a Love Coupon book redeemable online by June 1, 2014. Click here or watch below if your browser allows. Beautiful, Katie! Loving others is a great gift!